In this book chapter excerpt, find a walkthrough to configuring data in a NetWeaver PI RFC-to-file transfer. 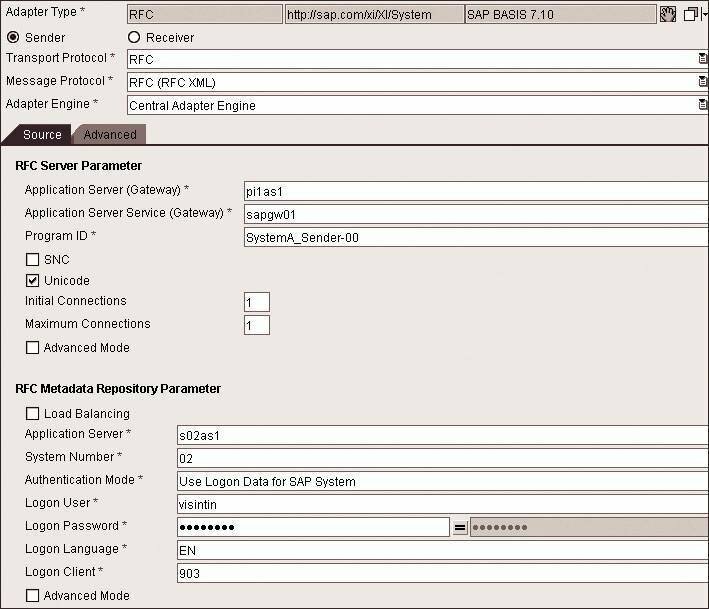 Read tips for monitoring the process and learn alternative ABAP mapping strategies. 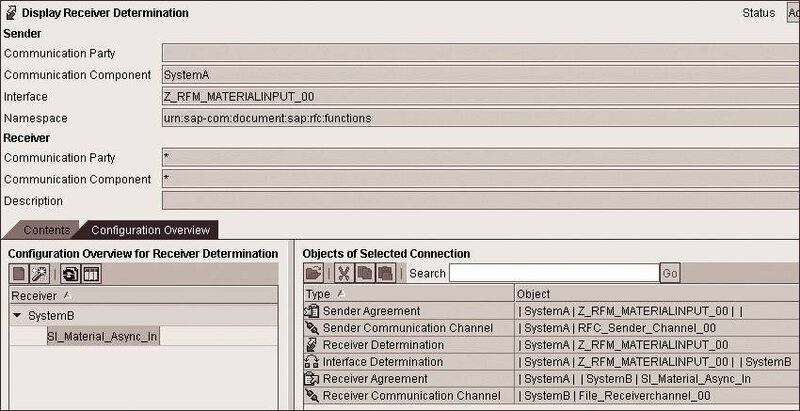 Read tips for monitoring the RFC data transfer process and learn alternative SAP ABAP mapping strategies. 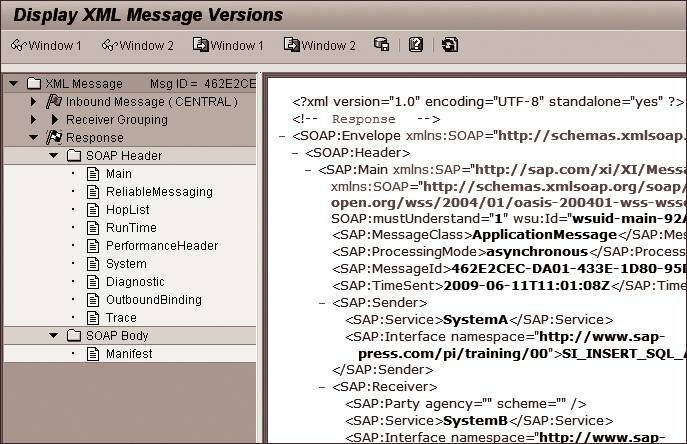 This excerpt from SAP NetWeaver PI Development — Practical Guide by Valentin Nicolescu is reprinted here with permission from SAP Press, copyright 2010. Download a copy of the PDF. Follow the Communication Component • Business System menu path. receiving file adapter for system B.
the name RFC_Senderchannel_##, and an appropriate description. In the details window, use the input help to set the adapter type to RFC. Engine fields in the upper area, just use the default values. Adapter), you created an RFC connection named SystemA_Sender-##. and is waiting for a corresponding counterpart. the values entered in the corresponding RFC connection in system A.
checkbox must be enabled if system A is a Unicode system. the RFC interface is imported from system A during the design phase. Sender-## is carried out successfully from system A.
own local file system to access the directory the file is created in. (FTP ), which allows access to the file systems of remote computers. administrator, we recommend using /tmp for Unix installations or C:\temp for Windows. Section 4.1.4, Process and Monitoring (see Figure 4.13). the PI system or the receiving system can further process the message. (see Figure 4.14). Save the sender agreement. 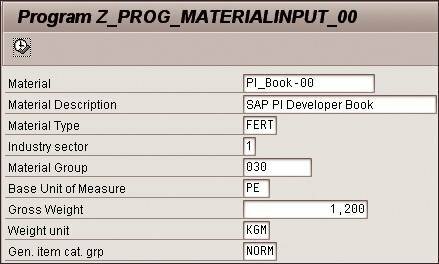 business system B and the receiving interface SI_Material_Async_In. communication channel of the receiver and save the agreement. true, the message is delivered to this system (see Figure 4.15). example, the condition can check elements of a message for specific content. always be delivered to this receiver, you don’t have to set a condition. click on the New icon to create a new interface determination . the interface determination and return to the receiver determination. matching operation mapping (see Figure 4.17). created and activated all objects for this integration scenario. Directory is the same as in the Enterprise Services Repository. monitor the process and examine any possible errors. call Transaction SA38; type the name of the program and execute it. create a production or sales order, for example. using the data from Table 4.4.
exercise, you can use the appropriate template files later. might not exist in the receiving system (see Figure 4.19). checkered flag in the Status column (see Figure 4.20). you to the Display XML Message Versions view (see Figure 4.21). or an object that was inadvertently selected from the input help. select the Runtime Workbench and logon using your user PI-##. components with every possible status. 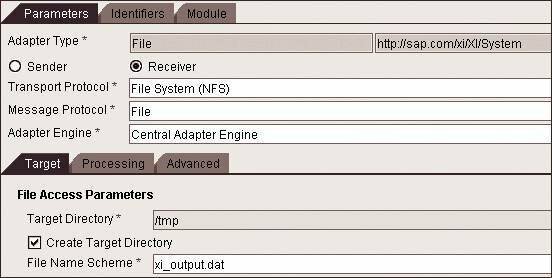 click the Adapter Monitoring button (see Figure 4.22). browser window opens and displays the selection of all available adapters. 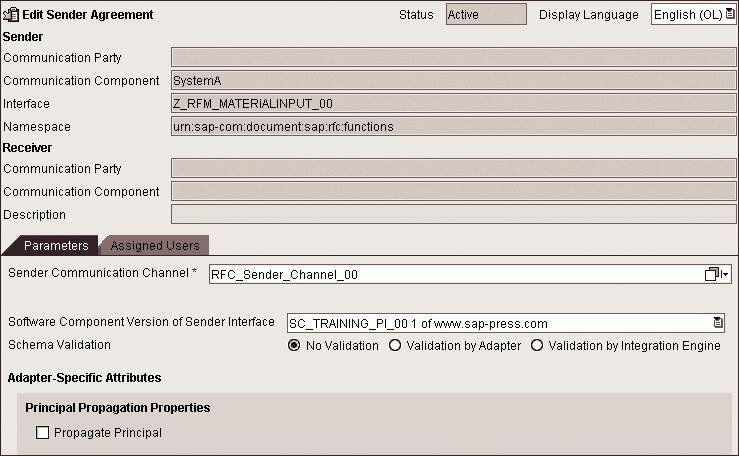 You’ll need to see if an error occurred for the adapter types RFC or File. which you can use to correct the error. 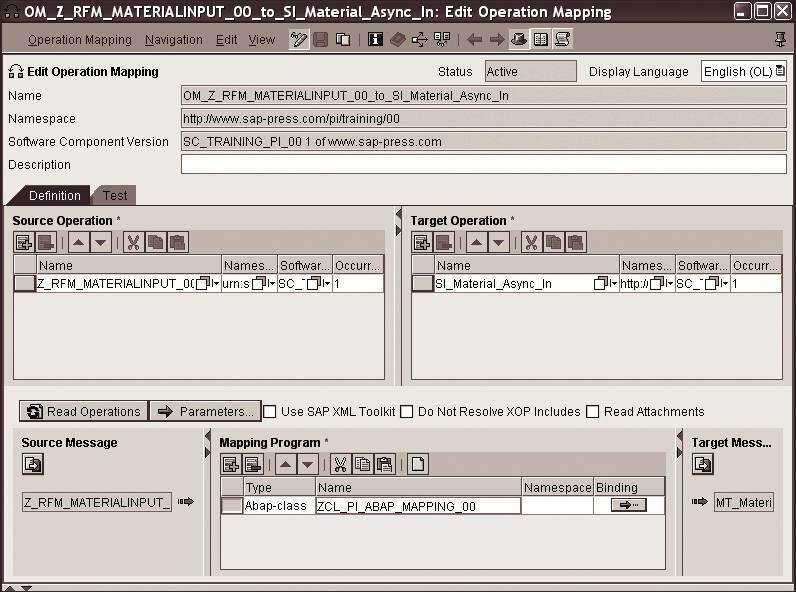 you will learn how to implement the same mapping using an ABAP class. 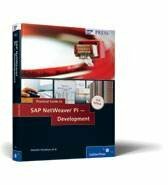 for development in the SAP NetWeaver PI system. Log on to the PI system and call the class builder with Transaction SE24. coding, let’s look at the XML view of the message (see Listing 4.1). method so it can be used later in the operation mapping. from the input document; most values can be inserted without change. material via IDocs (in the next exercise). the execution of the newly-created method in Transaction SXMB_MONI. responsible for compiling the output document. aforementioned operation mapping, and then switch to change mode. 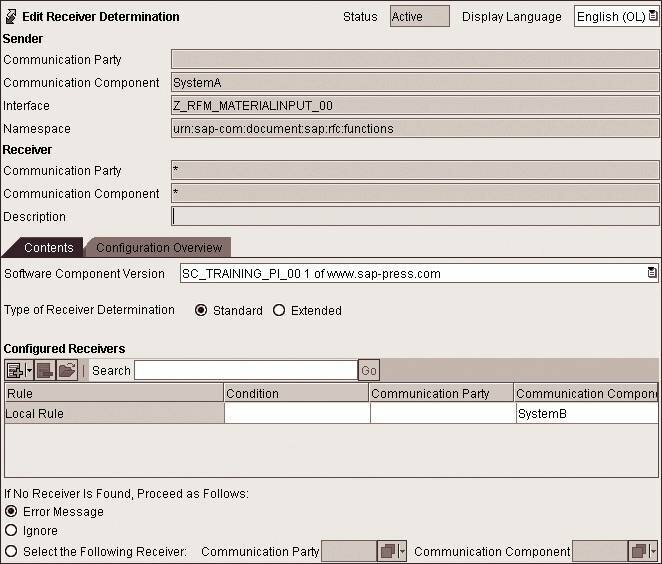 ABAP mapping cannot be tested in the Enterprise Services Repository. You can run the scenario once again by calling the program Z_PROG_MATERIALINPUT_##. find the log entry you specified in the ABAP class (see Figure 4.26).